Google this week launched a Ramadan (also called Ramzan in some regions) site to give devotees relevant information, such as timings of sunrise and sunset in the user’s region, during the holy month for Muslims across the world. Called the My Ramadan Companion, the site provides users with locally relevant tips such as the closest charity Iftar, nearby Halal restaurants, the traffic in the area around them, and even recipes. The Google site even showcases which YouTube videos devotees may enjoy, as well as health tips to stay fit during the 30 days of fasting. 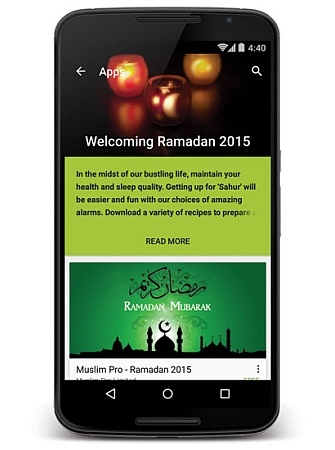 The search engine giant has also unveiled a special app section on Google Play, calledWelcoming Ramadan 2015, which showcases apps that can help during the period, from alarm clocks to wake up for Sahur, to greeting card makers and appropriate cooking apps. The firm’s Google Now virtual assistant will also show Android smartphone users Ramadan-relevant cards, which include news and information about the period, app recommendations.